SOUL FRIENDS has now become DEEP HUMAN CONNECTION. 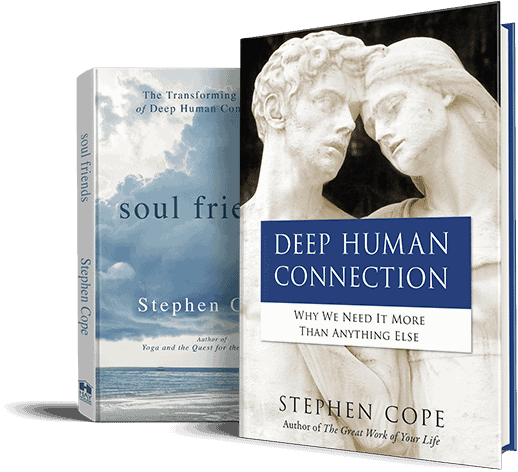 You may notice that the paperback edition of Soul Friends is being published on March 26, 2019, as Deep Human Connection. Why? I think the newly streamlined version really works well, and I hope you will agree. Those of you who’ve read the hardback edition will notice that the section entitled, “The Mystic Friend,” has been removed. Look for this material to appear as the basis for an entirely new book very soon!! However, notice, too, that there will be plenty of both editions available for sale for the foreseeable future. And thank you for reading!!! © Copyright 2018 Stephen Cope. All Rights Reserved.